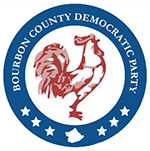 Bourbon County Democrats will invade Prichard & Bail at 108 E. 4th Street on Thursday, April 26th. The public is invited to “Catch the Blue Wave” at our spring fundraiser starting at 6:30 p.m. There will be lots of delicious food and great dance music with Double Dog Dare and guest musician Chris Sullivan. Prichard and Bail be will serving their famous cocktails, with a special event cocktail called, of course, The Blue Wave. Democrats will be honoring our retiring 72nd District House Representative Sannie Overly. She has served with great distinction since 2007. She was elected House Majority Caucus Chair in the last Democrat-majority legislature. She also was Chair of the Kentucky Democratic Party. Kentucky House Democratic Floor Leader Rocky Adkins will be the featured speaker. He has served the 99th Congressional District since 1987 and serves as Minority Floor Leader. Rep. Adkins has been mentioned as a possible gubernatorial candidate in 2019, but he is up for re-election in his district this year. Young Democrats and youthful voters are invited and encouraged to attend this event; however, house rules say if you are under 21, you must be accompanied by someone 21 or older. If you are under 18, you must leave before 9 p.m. If you will be 18 in time to vote in the general election this November, you should be registered to vote by now! You can also vote in the primary! The deadline to register is April 23rd. Go to GoVoteKY.com to register online. The music will be appealing to all ages. Double Dog Dare is a Lexington band with Shannon Arnold and Tom Turino. They specialize in Cajun, Old Time, Country Blues, and original banjo tunes. They’ll be adding surf guitar to their lineup for this event. Turino specializes in Latin American music and wrote Music as Social Life: The Politics of Participation and Music in the Andes. He performs on the 5-string banjo, button accordions, and guitar. Shannon Arnold has been playing Bluegrass and Cajun music for years in Lexington. When she worked as a teacher, she specialized in using music in the classroom, mainly for teaching French to children of all ages. Chris Sullivan has been in the music scene in Lexington for over two decades. He learned Flamenco guitar while living in Spain and listened to everything from Willie Nelson to classical music in his family home. He is part of the Latin-based band The Big Maracas, and The Swells, which is a more eclectic band featuring a combination of jazz, country blues, traditional and swing. Buy tickets at $25 per person on our website. Tables for 8 are available for $300, which gives the buyer credit for an extra $100 donation to the Bourbon County Democratic Executive Committee. The funds we raise are used only in support of local Democratic candidates.